TechInAfrica – A highly anticipated Ford Ranger Raptor trial units are going to be produced by Ford’s Silverton Assembly Plant in Pretoria. The first model units are introduced as part of the Ford Performance family with the specification: high-speed off-road and is a whole new benchmark for its model. It is set to be launched in South Africa in the first half of 2019. Before the launching of full-scale production of the new Ford Ranger Raptor trial units, the Silverstone Assembly Plan has produced the first 10 official Ranger Raptor units. The production is a part of the Tooling Trials (TT) build-up phase with a high-tech assembly line and an upgraded version. All of the production was with the investment of R3 billion from Ford in its local operations that were announced in 2017. Speaking of Ranger Raptor, Berry said that they are very excited about the new benchmark: “The Ranger Raptor is an exciting and very important model for us, as it pioneers an entirely new dimension for the pick-up or bakkie market and represents the first Ford Performance model to be produced in South Africa, destined for export to customers throughout Europe, the Middle East and Africa,” Said Berry. 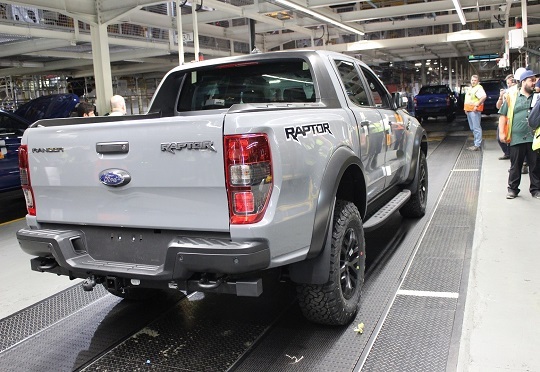 The Ranger Raptor is powered by 157kW / 500Nm 2.0-liter Bi-Turbo engine installed at Ford’s Struandale Engine Plant in Port Elizabeth. With the outstanding specifications as well as its masculine and aggressive design, the Ranger Raptor has excellent off-road capabilities.